Though you might know Dave Grohl as the frontman for the Foo Fighters or drummer for Nirvana, he's also co-founded the supergroup Them Crooked Vultures (in addition to being the band's drummer) and stepped in for session work with bands such as Queens of the Stone Age, Tom Petty and the Heartbreakers, David Bowie, Nine Inch Nails and Sir Paul McCartney. Now he's adding film director to that list with Sound City, a documentary about the famed recording studio in Los Angeles that has seen albums recorded from all those artists and more. Thankfully, Grohl rounded up these rock icons for some great interviews, classic rock star stories, and one hell of a jam session that must be seen and heard. Grohl's passion for music is unbridled as he talks to musicians and singers like Neil Young, Stevie Nicks, Rick Springfield, Trent Reznor and more, recounting the history of the studio where he and his friends from Nirvana showed up to record Nevermind, one of the most iconic rock albums of all time. His reaction to some of the stories and the time he spends reflecting on the studio's rise and fall (which happened twice) is like a kid in a candy shop. For this portion of the documentary, Grohl's varying style of filming the interviews was refreshing from talking heads looking off camera to Grohl sitting in the room with a particular subject or just chilling in a recording studio. These are stories from rock legends about rock history. It doesn't get much better than that. In addition, a hellacious soundtrack from all these amazing artists backs up all the factoids and tales from the past which include heartfelt entries from women who worked as receptionists (who also ended up dating and even marrying some of the rock stars or providing background vocals) to producers who have been around the music business for decades. It's the employees of Sound City, many who have come and gone over the decades, who have the most heartfelt stories to tell and get really emotional upon recollection of the studio's grand history (though the dingy studio was anything but grand in its facilities). However, one facility that was fawned over and never scoffed at was the Neve 8028 Console. It's the soundboard that has been in the studio for decades and that's where one of the more interesting parts of Sound City comes into play. Grohl spends a good amount of time talking about the digital revolution in music throughout the 80s. This was a time when elements like Pro Tools and digital sound manipulators and players came to the forefront for their ease of use, allowing for more fluid editing and backtracking. But Sound City stays strong with their analog tape recording which many of the artists will testify is a strength to the history and staying power of the studio. It's a segment that might create as divisive an argument among music fans as the preference for digital or film recording does for cinephiles. The one complaint I have with Sound City is that it might not cover enough thoroughly. Of course, in order to be the most satisfying, this would have to be hours long, and maybe even a documentary series. 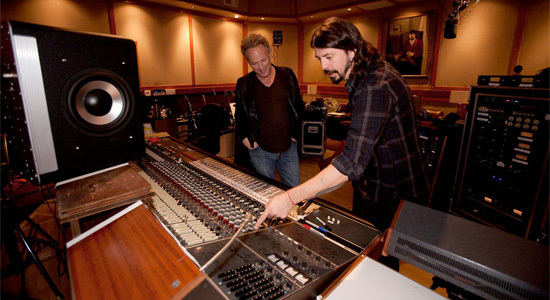 After all, Grohl glosses over how the Neve 8028 is great for recording anything but drums. There's an interesting segment on why Sound City is such a haven for recording music, but only the drums are used as an example (though this is explained because they make up the backbone of the song, and everything great can be put in on top of those beats. It's not a distracting flaw, and it's more of an inconvenience because I want to know so much more about the studio's ins and outs. But in the end, music fans will get lost in the wrap up for this phenomenal rock documentary as Grohl purchases the infamous recording console and takes it to his own personal studio. But rather than having it sit around like a museum artifact, Grohl rounds up some of Sound City's finest musicians for a jam session that is resulting in a full album of new music featuring Grohl rocking out with Paul McCartney, Stevie Nicks, Rick Springfield, Trent Reznor, the surviving Nirvana members and of course, the Foo Fighters. The result is a loud, raw, incredible recording session that will have you nodding your head and tapping your foot the entire way through. For the entire duration of Sound City, I had a big goofy smile on my face, and even had a couple tears settle in my eyes hearing some of these great musical icons talk about the start of their careers. This is all made possible by Dave Grohl, a guy who made this documentary as a tribute to all those who keep making music with real people, whether it's in their garage or in a makeshift studio. It's about not letting technology do all the work and act as a crutch for shortcoming in talent. Grohl isn't cocky, but he's respectful of his craft, and mixes no nonsense about his love for Sound City. The documentary isn't perfect, but Sound City is a revelation full of musical passion, love, raw energy and a fascinating chronicle of an unlikely historical music studio and the people who made it possible. I will forever and fuking ever watch anything involving Mr Grohl and Mr Reznor.. To get the chance to see both in not only in and interview, but in a jam session is a fuking dream come true.. The only thing better would be to see it live !!! There are musicians.. and then there is David Grohl and Trent fukkking Reznor !! !